This kit lets you add a manual lock and handle to your Pop & Lock custom powered tailgate lock. Includes 2 keys. Lowest Prices for the best tailgate from Pop and Lock. 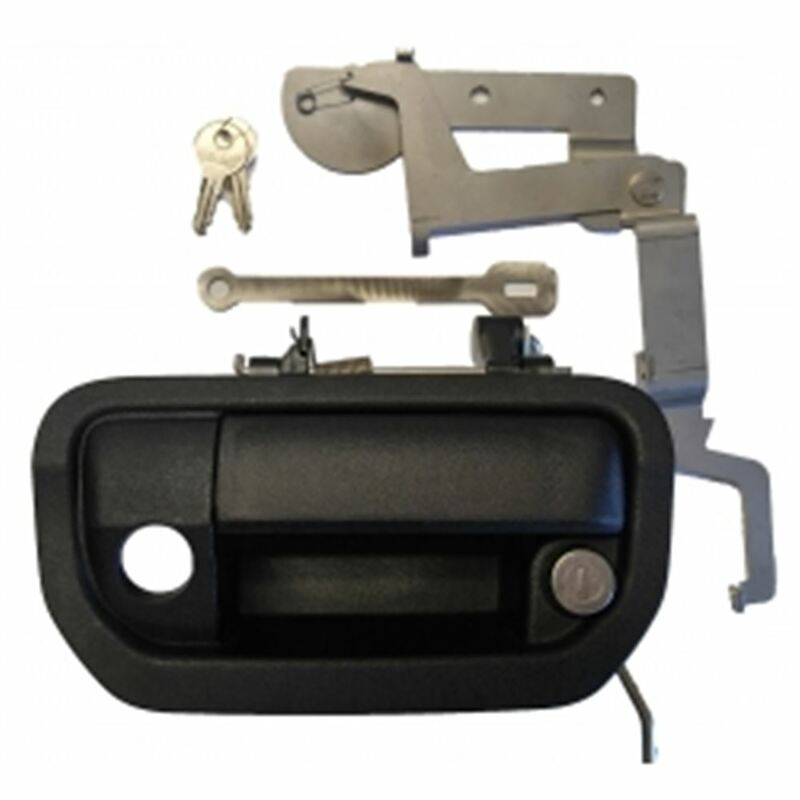 Manual Lock w/ Handle for Pop & Lock Custom Powered Tailgate Lock - Black part number PL6250 can be ordered online at etrailer.com or call 800-298-8924 for expert service. This kit lets you add a manual lock and handle to your Pop & Lock custom powered tailgate lock. Includes 2 keys. Frustrate tailgate thieves and cargo bandits with this key-operated tailgate lock. Use the Pop & Lock with your truck-bed cover or camper shell whenever you need to lock up valuables in your truck bed. Replace your existing factory tailgate handle with this ABS plastic tailgate handle that has a built-in lock. The lock mechanism is made of sturdy, armored steel to resist tampering. The black handle and trim around the lock complement your vehicle's trim and give you a straight-from-the-factory look. The lock is raised slightly for convenient key access and to help prevent your fingers from being pinched. And it installs easily using basic tools - no welding or drilling is necessary. Do you have a question about this Tailgate? If your battery were to die on your 2019 Honda Ridgeline then you would simply use your key to unlock your tailgate. The Pop & Lock Custom Tailgate Lock # PAL8600 just installs on the inside of your tailgate and automatically activates the manual lock. I have attached an installation video and the instructions for you to reference. The Pop & Lock Custom Tailgate Lock - Power - Black # PAL8600 on your 2019 Honda Ridgeline can be upgraded to add the manual lock as well without doubling up on purchasing the electric unit again. You will simply add the Manual Lock w/ Handle for Pop & Lock Custom Powered Tailgate Lock - Black # PL6250 which will also allow for the factory backup camera. This is designed to work with your current system. The Pop & Lock Custom Tailgate Lock - Power - Black # PAL8600 will work well on your 2017 Honda Ridgline. You will not be able to remove the back panel of the tailgate when it is closed and locked. I have not heard of this issue and they have been using this system since 2006 model years, but they do have a manual lock option you can add # PL6250 to replace the factory assembly to allow access in that circumstance. If the wiring on the Pop & Lock Custom Tailgate Lock # PAL8600 were to become damaged somehow then there isn't anything built-in that allows you to unlock it but you could also install the Manual Lock w/ Handle # PL6250 to avoid that situation. This kit adds the ability to lock and unlock the tailgate on your 2019 Ridgeline manually in addition to the power lock you installed. The closest option we have to what you are looking for is the part # PL8675 which is intended as a manual and a power lock for your 2019 Honda Ridgeline. If your vehicle didn't have power locks this kit could be used as just a manual lock so if you left off the electric connections it would work in manual mode only. Highest quality tailgate for the best price. Most detailed, accurate tailgate information available.